Christmas decorating begins slowly here. The nativity set and Advent calendar appear first, followed by a wreath on the door, and bits and pieces here and there. I'm fond of bringing nature indoors and that means, for us, a real tree. Sometimes we go to a pop-up Christmas tree shop a little ways out of town, but this year, time being short, we found fresh-smelling, narrow tree at our local grocery store. Tim stood the tree in its stand as soon as we got home, first cutting off an inch or two of the trunk and giving it a good drink. After some minor rearranging of furniture the tree stands in front of the window. Lights first, never my task. I shudder to think of doing that. We've collected and received ornaments over the years and there is little theme to our tree. It's fun to reminisce about ornaments as we hang them on the tree. Today we were at our son's home and on the tree there I recognized many ornaments I'd made over the years, or purchased. We gave one to each child every year. I often made one for our tree, too, so that it wouldn't be so bare when the children left home. Tim and I both agreed that decorating the tree isn't quite as much fun without the children here, but they are grown up and decorating trees for themselves and their families. We put on Christmas music and had a good time, after all. And the finished tree, smiling brightly. I like bowls of greenery - we have a holly bush with fat red berries that I clip, and cedar and rosemary from the garden. Pine cones sit in clusters here and there. The house looks so cozy and welcoming with the lights on the tree and mantel and other surfaces. Our weather has been so dull and dreary lately with dark skies and much rain. Any light is welcome. Over the years there have been a few tree mishaps. The year Tim and I were engaged, my parents' tree started smoking and was on the point of bursting into flames before Tim dragged it out the door. It was too close to the fireplace. One year, in Ecuador, we decorated the tree and the next morning found it taking a rest on the sofa. Tim stood it up again, and it stood well all day. The next morning we found it once again lounging on the sofa. Tim made sure that it wouldn't happen again. It didn't. It's made a good story. Another event this weekend was the celebration of our eldest granddaughter's 8th birthday. It's hard to fathom where the years have gone. One more week until Christmas. Classes finish on Friday, the 21st, at noon. So very late. Happy Birthday to your granddaughter! Smile... because I ˋm in the star sign Sagittarius too! Your tree looks lovely as always, Lorrie. Our trees are up and decorated also and we too enjoyed reminiscing about where some of the ornaments and baubles were purchased or who sent them to us as gifts, such a wonderful time of year. Oh so funny now the tree “lounging” on the sofa; not so funny then. Scary the tree too close to the fire. Yikes! My heavens, children are growing faster than ever before. I suppose that Blogdom has something to do with this impression as it is being reinforced over and over again with Bloggers’ children and grands and greats. Your tree is lovely and looks so much like my own right up to the angel on top. Hope this final week of school before break is fun and not too crazy. (Could they not have given Friday off? 🙃) Oh well, looks as if you have everything under control. I do love how you have decorated with natural leaves and berries from your own yard. It all looks beautiful. Those are lovely ornaments, Lorrie. I've had a couple of those mishaps over the years. Happy times with the children, I'm sure! The holidays sure bring back the memories! It's good to have some photos to help us too. Happy birthday to your little one. We had our oldest grandson with a birthday this week! Time flies! Holiday hugs! Your tree looks beautiful! About 5 years ago, we woke up one morning 3 days before Christmas, and all of the branches on our live tree collapsed and were hanging down. I don't know why because we watered it all of the time. Anyway we were having a big Christmas that year and needed a tree, so we bought an artificial one. I do miss my real trees. Your grandchildren look so very cute, Lorrie! The photo of them in front of the (very beautiful) Christmas tree is a wonderful memory of the December 2018. We decorate our tree traditionally on the 24th, but in the last years we have started to do it even some days before. Today I start visiting blogs and wishing Merry Christmas... but I'll try to visit you again before the festivities. Sweet celebration with your grands. Yikes the time does fly with grandchildren. Lovely tree and ornaments. No tree here, yet. We need to sludge out in the melting snow to cut it down. You must have had a very tired tree! I love to see an eclectic array of ornaments rather than a perfectly matched collection. They all have a meaning and a memory. I agree with you about decorating the tree once the family have left home, but it is always lovely to see the trees that they then decorate themselves with their own families. I love your ornaments. Hard to pick a favorite. Trees do fall down dont they? Our cats have been good about it this year and most years. Your granddaughter is lovely!!! Falling trees are a mystery. Lorrie - we adore fresh trees, especially the aroma they bring to the house; I may eat my words sometime in the future, but for right now I cannot imagine an artificial tree in our house … Our kids have always had the task to put on the lights, but this year it was our son and my husband since our daughter does not arrive until this weekend - ah, change! Your tree-without-a-theme is lovely - that's just the way we like it! Belated Happy Birthday to your grand-daughter - I do find time speeds up as we get older … thanks for joining Mosaic Monday, and enjoy your week ahead. Lorrie, The tree looks great! Mine is not up yet. Christmas gifts at this point come first. Have a great week. Sylvia D.
A real Christmas tree is THE thing. Yours looks very pretty with all the ornaments you have gathered. Yes, there might be some mishaps too - so funny :) My granddaughter Helmi = Pearl celebrates her 20th birthday on Christmas Eve. Unbelievable! Wishing a Happy Christmas time to you Lorrie & your family. My kind of tree. A tree laden with beautiful memories. Beautiful Christmas this year at your home and even more beautiful (and funny!) memories of Christmases past. Since even our great-grandboys are older than your grandchildren, decorating for us has long passed the fun stage and we do almost nothing except admire other people’s beautiful Holiday creations (kind of the same as we do gardens and flowers these days). But we wouldn’t have missed for anything those years when we went all out for the season. There's something fun and wonderful about Christmas memories. :-) I think I will cut some rosemary branches this afternoon. Joy of the season to you. Lovely to see your photographs, and I do agree the years go by so quickly, and the grand-children grow up too quickly! When we do our Christmas decorations we always play some Christmas music - it just makes it more special. Your tree is lovely. Yes, sometimes trees do have mishaps. 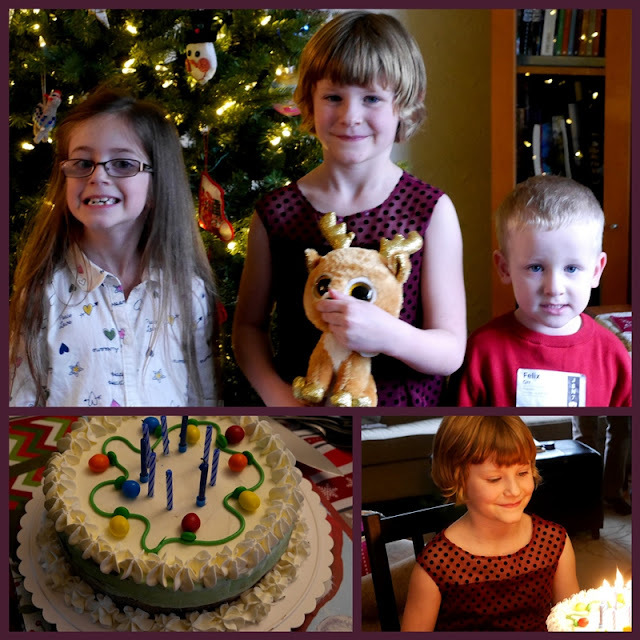 Wondering how your granddaughter feels about having a birthday so close to Christmas? My son-in-law is on Christmas day. This year we are planning something special for him, as he often cooks for Christmas and feels cheated. Have a wonderful Christmas and enjoy each and everyday of the celebration. Oh, that is so funny about the Christmas tree lounging on the sofa twice! 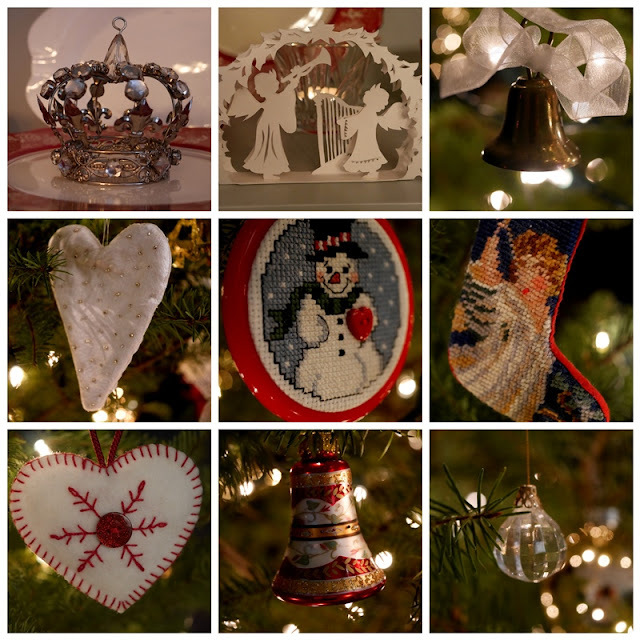 Your collage shows some beautiful and sweet ornaments. Yes, the years when the children leave home do change Christmas but now you are that wonderful kind of grandmother who is so much fun to have. And I must tell you that the years when these beautiful grandchildren grow up to have their own homes will fly past all too quickly. I have memory ornaments, too, Lorrie. I guess that's what makes it so special when pulling out the ornaments every year. Your tree looks beautiful! Happy 8th birthday to your granddaughter! I've been playing Christmas music everyday for weeks now. I hope you enjoy your school break. I'm sure it's much deserved! We're decorating slowly this year - and downsized to a 4 foot tree on a table in front of the bay windows. It holds all the special ornaments amazingly well and looks perfect. We have lots of fun tree stories too - one year we were going up hilly street and the tree fell out of the trunk and the car behind us ran over it - we picked it up and took it home and it was intact - but it was deformed in its growth and had a big kink in the trunk and if we trimmed it to that point it would be too tiny - so we wired it to the wall and it stood straight and tall - hiding its kink. Another year Don and our daughter had the flu and we dragged a mattress to the living room to be near the heater (we lived in a drafty old farmhouse upstairs) the tree insisted in getting in bed with them and after the third tipping incident I just undecorated it and put it away - it was almost the new year by then anyway. Happy vacation coming up. Lorrie, I enjoyed your post very much. There is something special about getting the house ready for Christmas little by little. Your tree is beautiful. Only a few days to count down... wishing you joy as we wait and anticipate this holy season. Your little tree is adorable and I do agree that children make it tad more fun! We have had quite a few Christmas tree mishaps through the years as well...a couple had to be wired to the wall to keep from falling over, one year we tied two flat backed ones together and they wouldn't fit in the holder so they sat in a bucket (it's a long story), another time hubby got a severe case of poison ivy after he went to cut a "free" tree down at a friend's place (not so free after a doctor visit and a prescription for Prednisone) but we've never had one to almost catch fire! That is scary stuff! Oh the memories Christmas can bring! Merry Christmas, Lorrie! Your Christmas decor is lovely, Lorrie. I also give my godson an ornament every year. This year, I also gifted some adult friends with fun ornaments.